Finally I was able to get out there and play with them shooters. Pretty much every single person on this forum has helped/contributed parts for at least one of these shooters, especially Rich, Quickster, Tinker and MANY others. It was somewhat colder (about ~60 degrees), so, one could expect CO2 guns to shoot a little harder when it's hotter (for example, the 2540 was shooting way closer to 600 fps in the scorching summer of 2017). Thanks again, CAPOF Forum, for infecting me with Crosmania several years ago. UPDATE: I simply can't compress pics small enough to post here. For a quick fix go to Twitter page https://twitter.com/QuicksterCAPOF until I figure out how to shrink 'em even more. Here are my two favorite shooters. The Mountain Air 2540 has custom XL size maple grips made by Vernon Austin (he does GREAT work), XL bolt handle made by Rich, a Grant Stace brass trigger, a few Charlie Mellon internals, scope from Quickster and an LDC made by Rich but took it off last year to show a fellow shooter and never got around to getting it back on. 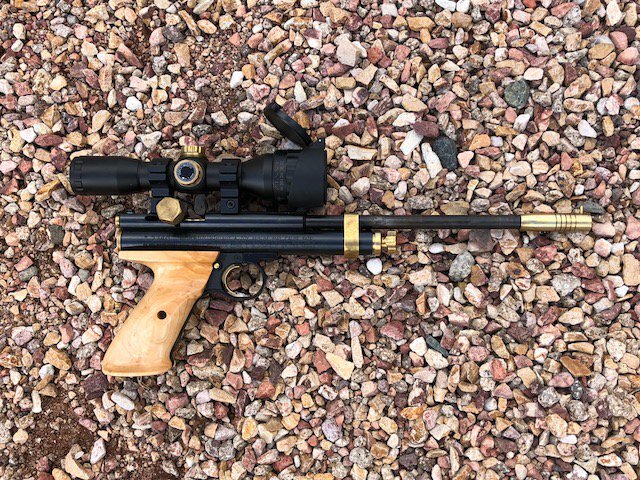 This things hits DEAD ON at up to 20 meters and has hit the bell in the .25" bell target hole mist likely more than any other shooter I have (keep in mind the pellet is also .25 caliber/.25" and it still tags the bell if I do my work). If I had to choose just one shooter to keep, it would most likely be this one. About ~30 decent shots per cartridge. 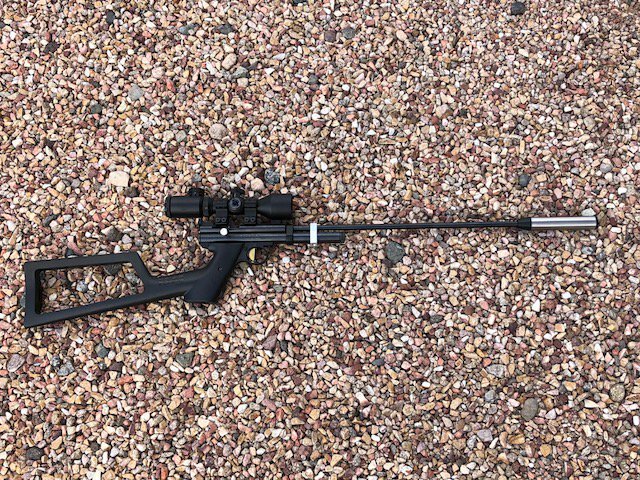 The Mountain Air 1750 has a 19" Crosman barrel, coolio trigger and LDC made by Rich, 1399 stock and a few other tweaks as well. Just like above, if I do my work it can hit the bell target all day long (sort of like eating grapes on a good day). I was absolutely amazed when it was whizzing 7.9 CP pellets close to 800 fps with amazing accuracy last summer, picking off chicken eggs with ease up to ~50 meters. Depending on my mood, I may take this one over the 2540 if I had to choose just ONE shooter. Close to ~50 good shots per cartridge. Thanks Cobalt327 for helping me post the pics. Of all the rifles, I'd have to say the CZ Slavia 634 is my favorite. Purchased from a guy on The Yellow who had tuned it beforehand, it shoots crisp and accurate and is fun to shoot all year around. Being a springer, it's a little tough to dance with but better than anything I've used thus far. 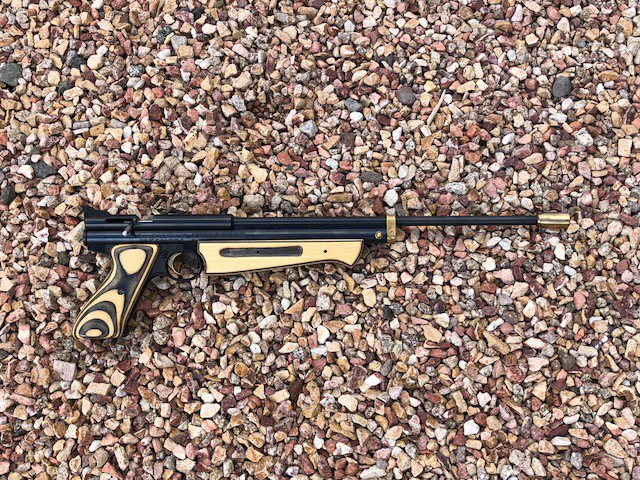 The Mountain Air 1377 has a 17" Crosman barrel, Charlie Mellon probe, handle and pivot points, custom RB Grips (poor guy doesn't make them any longer) and even with my poor eyes can shoot incredibly accurately with just the iron sights. Another great shooter for all year around. Noah, not counting or anything but, seems like you really like ALL the shooters. They are a great group that, in most cases, can't be duplicated. Sure sounds like a fun shoot. Thanks, Bill. Good observation that I guess I like all that I have left as I thinned the herd a while ago and kept the "keepers." Yes, great fun. This is where I do most of my shooting. Nowhere else in the world I would rather be while listening to lame-o talk/news radio, soaking in the mountain views and shooting at whatever I like. Because I don't shoot anything alive (don't kill it unless you intend to grill it), I simply punch paper, ring the target bell, blow up expired canned food from the early 2000s and whatever else grabs my attention. Nothing like acting like a 12-year-old again. Note: I certainly feel like a 12-year-old (more like a 3-year-old) as I can't figure out how to align/rotate the pic upright. Very nice all weather shooting range, Congratulations on a job well done. 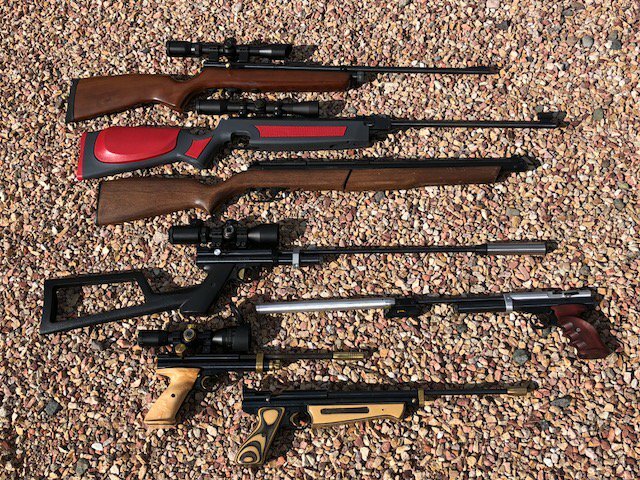 You have a nice collection of shooters. Nice shooting spot. Looks like everyone is getting the itchs again, good to see im not the only one. Thats a nice group you kept for the keeper heard. Glad to see this!! Weather has been miserable here forever so my shooting has been limited!